Robert Sabuda’s interpretation includes two full decks of playing cards. 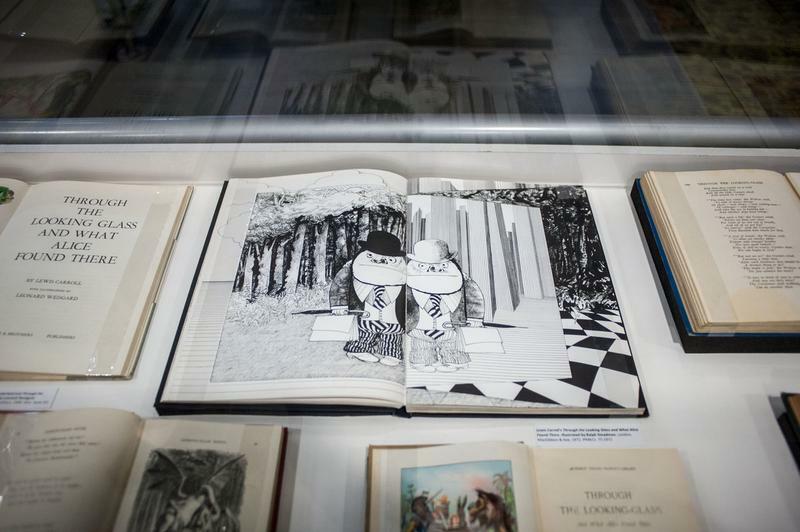 Rare Books and Special Collections, that brought you the 1800 year old papyri and a medieval papal document, now has a new exhibition: Alice in Wonderland. That’s right, Alice is 150 years old this year and UBC master’s student Kristy Woodcock has curated an exhibit of Wonderland through the ages for its sesquicentennial birthday — don’t worry about pronouncing it, you probably won’t have one anyways. If you want to take a break from studying or crying in Irving and take a gander, the exhibition has some beautiful, weird and interesting pieces that take you from the first publication in 1865 all the way up to this year. On display are only 50 out of the 700 total books that the Rare Books and Special Collections has about Alice and Lewis Carroll. There are a couple editions on display that really do stand out. 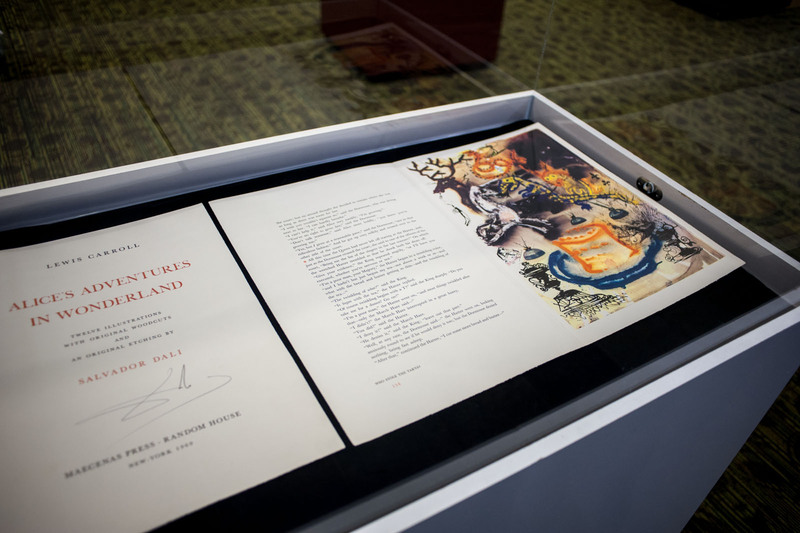 The first is Salvador Dali’s illustrated interpretation of Wonderland, which is actually signed by the artist himself. Obviously it’s very surreal, but it really suits the story and the time in which it was published in 1969. You can actually get a trade edition as well if you’re a book nerd like me. The second version that really stands out is Barry Moser’s, which has incredibly dark and morose illustrations. The third, and my personal favourite, is Robert Sabuda’s pop-up book. 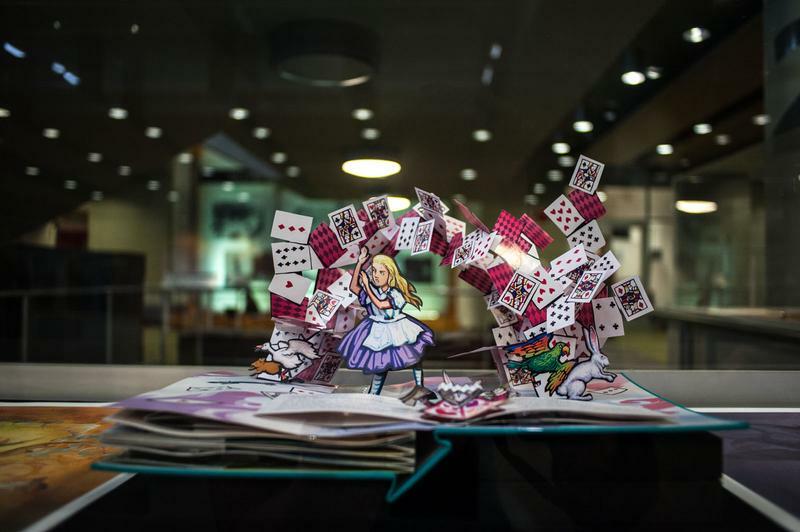 The page featured on display has Alice in front of a whirlwind of playing cards. The illustrator of the book has included two full packs of cards in particular that pop-up, which you can count for yourself if you really don’t want to go back to your readings. In the collection, they really do collect anything that has to do with Alice, including translations and parodies. One on display is Adolf in Blunderland, a political parody where “everything is propaganda in Wonderland and nobody is talking any sense, just like Hitler,” according to Woodcock. 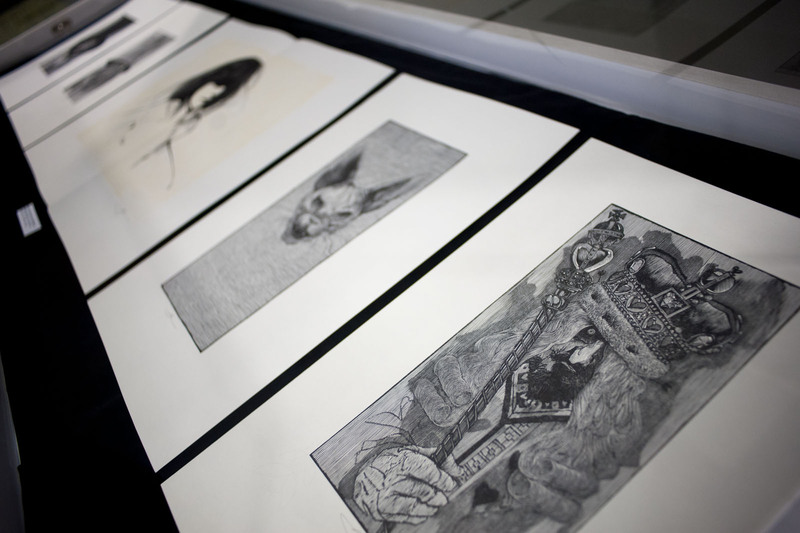 Every Alice you can possibly imagine is displayed chronologically, from a facsimile of Lewis Carroll’s hand drawn manuscript to ones published this year — she looks different in every one. “Her image is continually reimagined and obscured throughout the years. We just don’t know who she is anymore,” said Woodcock. Go take a look at the displays and decide for yourself.